Whether you dread it or embrace it, it’s coming….wash day that is. And since it is inevitable, why not make the best of it by using products that make taming that mane more pleasurable!? 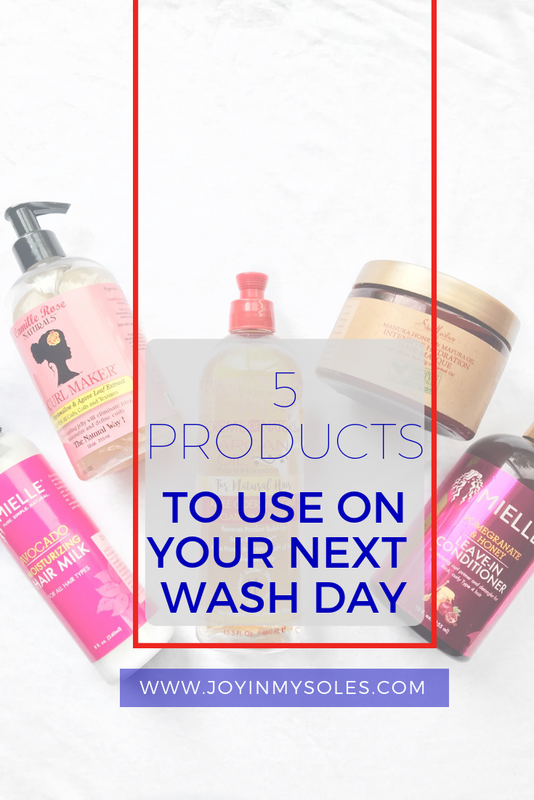 Today, I’m sharing with you 5 products I personally use and love on my thick and sometimes unruly locks for cleansing, conditioning, and styling. -Some of you may or may not know that apple cider vinegar (ACV) is really good for cleansing the scalp and removing build up. This Cream of Nature ACV rinse does just that. Sure you can use plain ole diluted ACV, but the Cream of Nature ACV rinse also contains argan oil and doesn’t leave you smelling like vinegar all day. I typically apply this to my scalp before shampooing and let it sit for a few minutes before rinsing it out. After rinsing it out, I follow up with a shampoo or a co-wash depending on which wash routine I’m using that particular day. -I’ve done an extensive review of this deep conditioner and I still stand by it. This stuff is bomb on my hair and works wonders for softening and deep conditioning my strands. If you don’t currently use a deep conditioner, you should definitely be using one (read why here). If you’re in need of a new deep conditioner to try, consider this one. -I’ve also talked before about leave-in conditioners and some leave-ins I love. However, this particular leave-in is fairly new to my cabinet and I have been using it non-stop since I got it. It smells amazing and does a great job at moisturizing and keeping my hair soft! I use it after rinsing out my deep conditioner and before I apply any other styling products. This hair milk hydrates my hair and keeps it so soft. I typically use it for my twist-outs or under a gel when I’m wearing a wash and go. It’s a pretty light moisturizer and can be applied several times during the week if needed. -Ok, for this one, you have to have your money up lol cause it’s on the pricier to me. However, it works great for wash and go’s. I’ve been having it for a while and just decided to crack it open this summer for my summer wash and go’s. It definitely had my curls poppin! If you like to use gels for your twist outs, I’m sure you can also use this product for that as well. It gives you a nice hold without making your hair extra stiff. Have you tried any of these products? What’s your wash day go-to’s? Let me know in the comments!